Thecontroversy over the Fountain of the Pioneers lies in its depiction of the encounter between European American pioneers and Native Americans. Iannelli’s design features a white pioneer standing head and shoulders above a Native American and depicts “what he understood as the stoic but futile resistance of the Native Americans to the westward expansion of European American settlers.” Iannelli’s romantic view of Native Americans’ role in United States history was common during his time. He was also ignorant of the local Match-E-Be-Nash-She-Wish band of Pottawatomi, who have continuously resided in the Kalamazoo area despite attempts by the federal government to forcibly remove them. Many visitors to the Fountain have since denounced it as a racist monument and demanded it be removed or destroyed. In light of the public outcry, the Kalamazoo Historic Preservation Commission partnered with the Match-E-Be-Nash-She-Wish to acknowledge the problematic aspects of the Fountain and to present a more accurate history. Using the Next Exit History app, members of the Match-E-Be-Nash-She-Wish and the Historic Preservation Commission are collaborating to share the Match-E-Be-Nash-She-Wish’s history in their own words. In addition to a Next Exit History page about the Fountain of the Pioneers, pages marking the locations of each of the four corners of the original Match-E-Be-Nash-She-Wish reservation and the Native American mound in Bronson Park have also been created. These pages feature text and images approved by the Match-E-Be-Nash-She-Wish and detail their history in southwest Michigan. Additionally, each of the corner pages features a video of the Match-E-Be-Nash-She-Wish giving their own oral history. These oral histories include discussions of treaties made and broken, resistance to removal, federal recognition, and the Match-E-Be-Nash-She-Wish’s lasting impact on the economic and cultural landscape. Detail of a 19th-century map of Indian Land Cessions in Michigan. Match-E-Be-Nash-She-Wish’s Village labeled at center-left. Unfortunately, calls to remove the Fountain of the Pioneers from Bronson Park persisted despite the public education work by the Kalamazoo Historic Preservation Commission and the Match-E-Be-Nash-She-Wish. The issue came to a head early in the morning onMarch 6, 2018. After hours of public comment and debate, the Kalamazoo City Commission voted 5-1 to remove the Fountain of the Pioneers from Bronson Park. While many in the community felt this as a blow to local history and art, it is a comfort that the Next Exit History pages will remain accessible to the public. 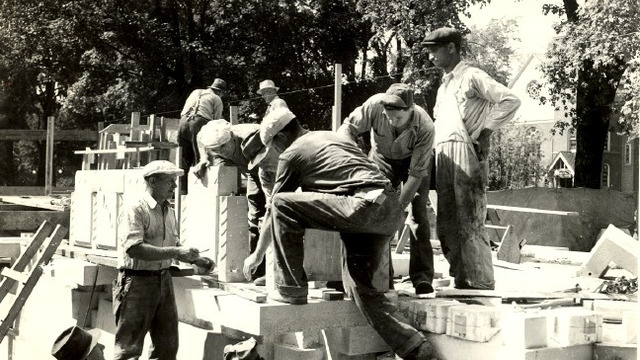 Construction of the Fountain of the Pioneers, circa 1940. While the Next Exit History pages will continue, other educational components of this project now face an uncertain future. Proposed measures such as aneducational panel in Bronson Park, street signs identifying the reservation’s boundaries, and physical markers at the reservation’s corners have been put on hold.Therefore, without the physical reminder of the Fountain and other educational initiatives as a context for teaching about colonization and westward expansion, Next Exit History has become even more important as an educationaltool in making the collaboration between stakeholders and experts visible to the public. Jenifer Blouin Policelli is a lifelong resident of southwest Michigan. She recently received her Master of Arts in Public History from Western Michigan University and currently works with the Kalamazoo Historic Preservation Commission.